Welcome to the latest giveaway here on Why We Love Green! This giveaway is for Baltic Amber Jewelry from Spark of Amber! One lucky winner will be able to choose their own Baltic Amber jewelry item--for a child in need of a teething necklace or an adult looking for fashionable and healing jewelry! 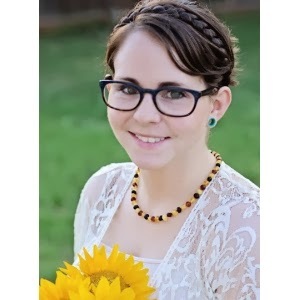 Spark of Amber sells a wide variety of Natural Baltic Amber necklaces, pendants, bracelets, anklets, rings, and earrings! All of the amber in the Spark of Amber shop comes from Lithuania and the Baltic region and is tested for quality and authenticity! I am enjoying my lovely Baltic Amber bracelet from Spark of Amber and I can really feel a change in my body when I wear it. 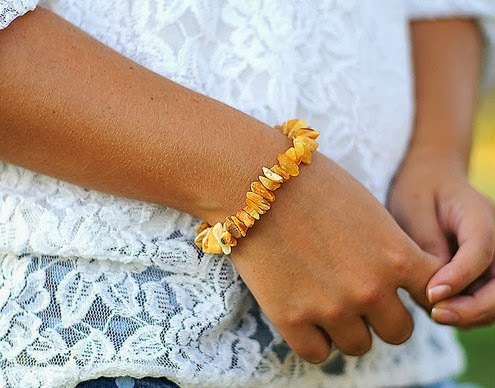 I received a beautiful raw gold and white Baltic amber bracelet. I've gotten so many compliments on it! Spark of Amber sells bracelets and jewelry for adults, as well as lightweight Baltic Amber Teething necklaces and bracelets for babies. The Succinic Acid found in amber is said to have all-natural anti-inflammatory, pain relieving, and calming properties, which helps babies during teething time. In addition, Baltic Amber has been used to calm headaches, skin irritations, thyroid problems, and many other conditions. Disclaimer: This giveaway ends at 11:59 PM EST on November 18, 2013. The Anything Goes Event Bloggers, including Why We Love Green, are not responsible for sponsors that do not fulfill their prizes. Companies and bloggers, if you would like to participate in group giveaway events like this one, sign up to be emailed about future events hosted by The Review Wire or contact Christine at Why We Love Green.